It has been a long time since I wrote at this Blog site. A certain friend named Jim requested/suggested that I write about Don’s and my trip to France. We fly out of Dulles Airport (Washington DC area) on Tuesday, September 9, arriving September 10, to Charles de Gaulle Airport in Paris. If all goes well, we will rent a car that holds our tandem bicycle and head into the city to stay for 2 nights at the apartment of French friends we met in the mid 1970s in New York City. Then on to the GREAT ADVENTURE. Much more later but thought I should have a little practice at this blog thing…. 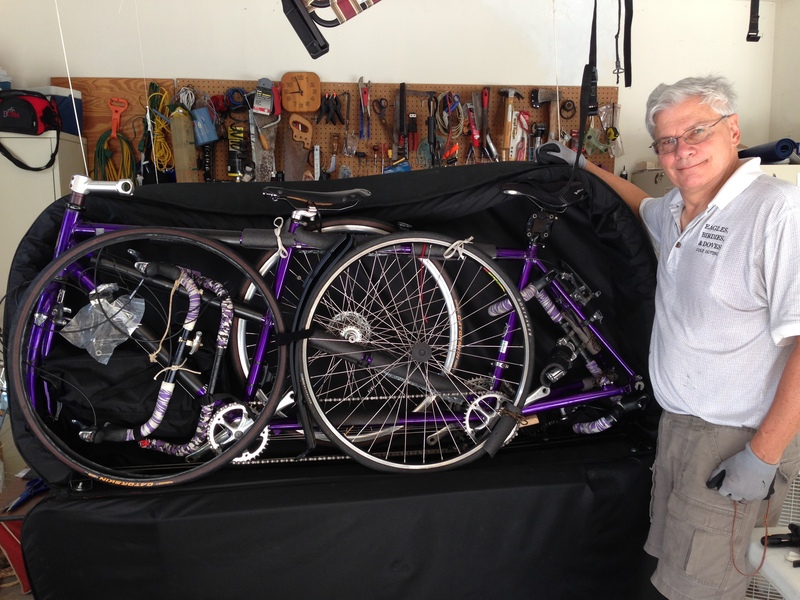 Packing our tandem in Bike Pro case, hoping United Airlines will accept it (for a fee), so it can travel with us to France. Looking forward to keeping up with you, as Maren said HAPPY TRAILS. I’m SO glad you are going to blog this, it sounds like a dream trip. Have a great trip and we’ll look forward to your posts. Looks like Don did a great job of packing the bike. Hope to be able to follow you trip! Have an amazing trip! I will live vicariously through you. Gary is getting ready for another stem cell transplant on 9/16! Bon Voyage and Bonne Route. A Bientot j’espere. So glad you decided to blog your trip……looking forward to your posts!